In 2009 / 2010, it's all about truculence. "We require, as a team, proper levels of pugnacity, testosterone, truculence and belligerence." Tonight, at 7pm on TSN2, the truculence begins. I am realistic but i am somewhat pleased with our direction. I have a question. Are we going to jump out to a good start in true Toronto Fashion, just to play horrible hockey right up until the 62 game mark-- when we have to win a few more just to miss the playoffs by 2 pts??? I'm with Ryan on this. I missed Burkie when he was lost in CA. What Sedin means is still the best rant to date. I've seen a lot of truculence thus far tonight. The forwards are truculent, the defense is truculent and the goalies are truculent. With truculence like this, we might just finish 8th in the East. Well... I just came back from the game where I was mixing the show for TV... different looking team, same results thought. Couple of new additions did look good though. This is it the Leafs will finally do something. What that is they don't even know. All I know is that freediep.ca will become more interesting. As like all true Leaf fans in the spring the only thing that will make them smile is making fun of The Canadiens. Tabernaque, c'est temp pour manger de la poutine. Leaf fans are so gullible and stupid. The team is bad. They will start bad and they will end bad. They will sell out every game and a tonne of people will still think they have a chance every step of the way. Go Toronto hockey. The city that loves the medicore. Firstly, I love the McNulty handle. Fantastic character from The Wire. Might be #2 on my list, after Omar. Note to self: make a list. This team might lack some skill up front, but we'll be truculent. Nobody wants to play a truculent team. In my books, truculent is better than mediocre. One day, we might even be good. I am tired of having any optimism about a Toronto team. I was so optimistic at the begining of this Jays season and in the end I was disappointed. 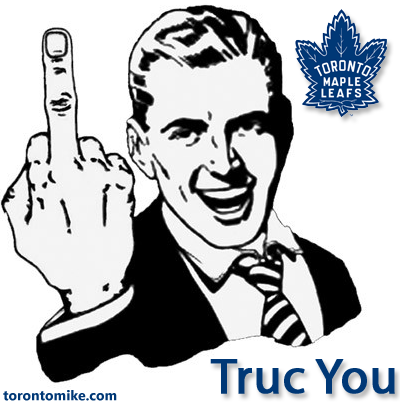 For the Leafs I will expect nothing and if I am proven wrong then I will be more than happy to admit my error. That as Snoop said, "Is one of those good problems." Yes, I would love to see your list. I just lent the disks to another person. Him and his wife and chewing through them as fast as you did. I know its only 1 exhibition game thus far but the problem the Leafs are going to have is scoring goals. Burke has built a solid defensive core and hopefully they finally get reliable goaltending but they don't have any scorers. Even if they get Phil Kessell, he's not the answer. Yeah all the fights are great - if you're 12. The Leafs are a still a joke. Love the image, Mike. Go Leafs Go! Two games into the season and all are ready to abandone the wagon. This is the time of the year everyone gathers the dried up Leafs and put them in the compost pile. Give your heads a shake and smell the coffee, this is Toronto we're talking about. So much for the TRUCULENCE, Komiserek has put the Leafs on penalty kill allowing Montreal and Washington to step all over them. Let Burke know, he's got to back off the PUGNACITY until they start winning games.